AllegroMedical.com presents The Sensi-Care Protective Barrier Step 3. 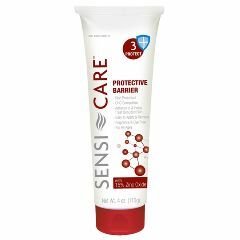 Sensi-Care Protective Barrier provides extra protection for high-risk skin. This zinc oxide based barrier in Sensi-Care guards fragile and sensitive skin to help treat and prevent irritation due to incontinence as well as diaper rash. Contains petrolatum with zinc oxide. Bedtime. After Shower/Bath. Dry/Chapped Skin. Irritated Skin. Home health care nurse recommends this product for long term care use of potential pressure points. This is some awsome stuff!! Long Lasting. Moisturizes Well. Goes On Smoothly. Got a tube of this from the VA hospital after my hip surgery. It works so well that I order it all the time. Its well worth the money!! by Mickey from Norborne, MO. Long Lasting. Goes On Smoothly. Smells Great. Not Greasy. effective for skin breakd. Bedtime. After Shower/Bath. Irritated Skin. skin breakdown. Use product for incontinence care when skin is broken. Product is thick and provides good protection from wetness. Long Lasting. Moisturizes Well. Goes On Smoothly. Not Greasy. Skin Protection. Quality Oriented. Brand Buyer. Budget Buyer. Use Sensi-Care around a deep pressure ulcer to prevent irritation from incontinence. No redness or irritation since using this product. by Tommy Boy from Washington, D.C.
Long Lasting. Moisturizes Well. Goes On Smoothly. thick. Bedtime. After Shower/Bath. Daily Use. Irritated Skin. Budget Buyer. Quality Oriented. time saver. Mom is prone to skin problems, especially in the brief area. This is thick, hard to spread sometimes, but stays put and protects great. Can't be used on broken skin but, red irritated skin gets a boost from it. I usually use the Comfort Bath cleansing disposable washcloths, but you could also use soap, water and a washrag to remove it. It comes off good with a warm soapy washcloth. A soapy warm wash cloth works, but I usually combine the sensi-care crème with the Aloe Vista protective ointment. It's oily so it comes off easy, or just apply some baby oil or lotion first than the sensi-care. I usually use saline (sodium chloride) and it comes off easily every time. I've been using it daily for several years. Answered on May 10, 2015 7:22:41 PM by Charl from Washington, D.C.